Deciding on the best dual lipo charger is never an easy task. Sometimes walking into a store physically and asking the store owner to help may solve a bit of the problem, but buying it online is never simple. There are so many options and so many companies offering one deal after another. The concern is what should you choose and what is better than the rest. This is a constant challenge, and that can often be extremely overwhelming. There are several technical elements that many of us may not be well conversant with. Additionally, the purpose of the charger is also important. The frequency of usage, climatic conditions and competence levels of the users all make a difference. A little miss and you may end up buying something rather inappropriate for you or something way too expensive. But we decided to make the task a lot easier for you with our comprehensive guide on the best dual lipo charger. From helping you rate a variety of the top offerings in the market, we give you finer details on a variety of products. For the uninitiated, we also help you understand what is important in a Lipo Charger and the key features that are an absolute necessity. With this systematic and broad-based buying guide, you can easily skim through a range of options across a wide spectrum of price band too. You can take a look at your necessities and budgetary constraints too. That means you can look for quality products within a budget. Remember the cost is also an important factor when you are considering buying these accessories. 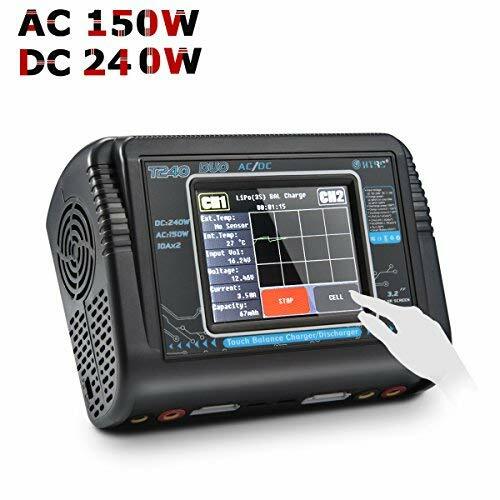 That is what will help you gain a meaningful value for money deal without compromising on any of the features and always bag the best dual lipo charger. 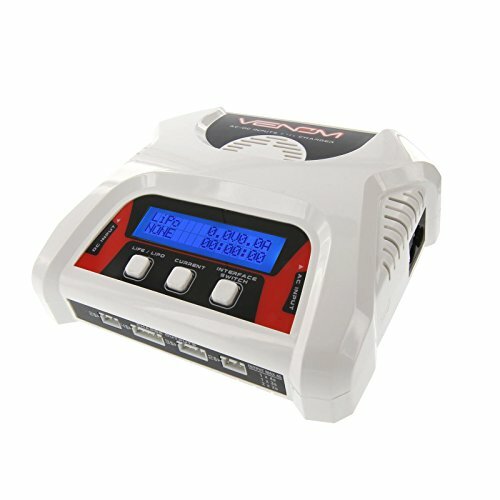 When you are looking for the best dual lipo charger, the Venom 2-4 Cell AC/DC Dual LiPo Battery Balance Charger is one of the most worthwhile options to explore. Whether you are an entry level enthusiast or pursue an intermediate RC Hobby, this charger will serve you rather appropriately. There are some unique advantages to this model. It is equipped with a single 4 cell, 3 cell as well as dual charging ports. In simple words, you can use the same charger to charge two 2S batteries at one go. Some of the unique features of this charger include an auto current detection facility and also assessing the capacity of individual cells. You can even identify the cell count using the charger, and it is equipped with an automatic cut-off facility. This is a particularly important feature as this is what ensures the safety of the charger, user and also maintains the temperature. That means the risk of overheating is also addressed to a large extent. The LCD display no doubt adds to the user convenience and ensures that users understand that exact position and condition of the charger. Click here to see the best price. Poor quality tests and the battery runs the risk of overheating and some users even mentioned the risk of the charger damaging other devices as a result of this. 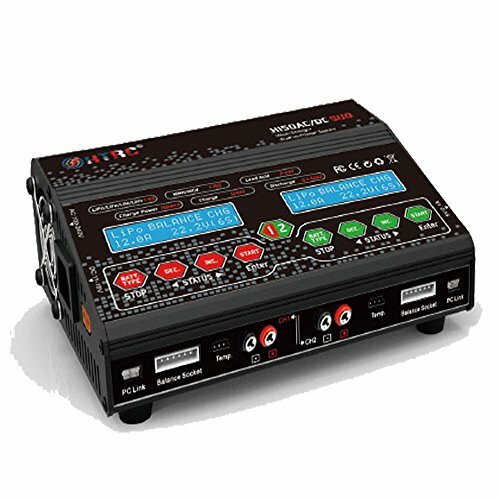 The Hobbymate D6 duo figures prominently in the list of some of most effective and best dual lipo battery charger. It is equipped with auto detecting lipo cells and has a dual independent charging port. That is what goes a long way in optimizing the operating software of this battery in a significant way. This one also has an independent lithium battery balancer. This is very important for balancing individual cells during battery discharging process. So, this is one of those chargers that help you to successfully undertake every type of charging function with ease and fairly comfortably for an extended period. Another striking aspect of this charger is the all-in-one protection of your device. It protects your device from overheating, exceeding the time, capacity limits, input reverse protection, saves the risk of short circuit and also cuts down chances of overcharging and voltage fluctuation. Apart from the standard balance charge mode, it also has a fast charge, storage mode, and discharge options. The other standard features like cutting-off to control overheating and voltage control are also available in this device. Click here to see the best price. When you are listing out the best dual lipo charger, it is impossible not to mention that HTRC duo Lipo duo battery charger. It has the ability to charge two different batteries with different voltage. That means you can save a lot of time. The maximum AC input power for this device is 100-240V while the maximum DC input power is 11-18V. That means it covers a more or less broad-based range of batteries and can be used for a wide range of purpose. The LCD screen makes it an immensely practical device and keeps the users informed about every small or big change in the charging parameters. This is also an extremely versatile and multi-functional lipo charger. It is equipped with a charge balancer, has discharge facilities and a terminal voltage control system. The lithium battery capacity & voltage checking facilities make it an extremely practical device and even enables users to check the internal resistance of the battery. This is a primarily smart charger. It can memorize up to 20×2 data of the batteries, and you do not have to set the proper value for the battery every time while charging or discharging this. Click here to see the best price. However, consistency of quality is a major concern and several user reviews indicate a fair degree of inconsistency in this regard. If only looks can seal the deal, this is decidedly one of the best dual lipo chargers you could look for. The compact design, the pure aluminum exterior, and well-constructed solid set-up make it an instant game changer. The 2×16 LCD display screen further enhances its functionality and versatility. It makes both the reading the operation of the gadget way more simple and lot more effective. This charger can be plugged into the wall directly and comes equipped with two separate and independent output port. So at any given instance, it does not just charge two batteries but also two different kinds of batteries simultaneously. The circuit power at each output port can reach up to 150W and can deliver the maximum current of 12A. So it is almost synonymous with high power and a distinctly higher degree of efficiency on an overall basis. As a result of these features, this is a very convenient and effective solution for a wide variety of batteries from 1-6s. 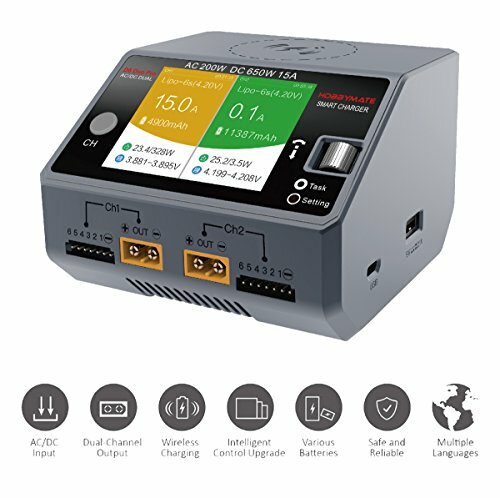 This is one of those chargers where the users can easily set up the charging current limit and also pre-determine the capacity limit. The temperature threshold and the processing tie can all be fixed earlier and then you can go about your charging needs. In many ways, these controls also make this charger way safer to use and extremely practical in terms of both the degree of efficiency and adaptability. It also has other standard features like terminal voltage control, lithium battery capacity, data storage, and loading function and voltage checking facilities. The USB DC output also adds to the overall efficiency and flexibility in terms of using the charger anywhere and anytime. Click here to see the best price. The consistency of the quality is also questionable as some users highlighted issues with the charging channels or reported receiving devices with faulty channels. This is a sleek, easy to operate and an extremely effective lipo charger. The reason why it features so prominently in the list of the best dual lipo charger is both its efficiency rate as well as the functional element of the device. It is extremely easy to operate the device and is high on user convenience. The touchscreen also enhances operational ease. Whether you are at home or outside, it is never too difficult to either carry this or operate it. This is also a multi-chemistry battery charger. That means this charger supports all types of Lithium batteries like LiPo, LiHV, and Li-Ion as well as Nickel Metal Hydride or Nickel Cadmium batteries. It can also charge Lead Acid based batteries. The range of features includes balance charging, discharge facility, storage charging. It is also equipped with a battery meter for easy reading. This smart charger can easily store profiles of up to 20 batteries and has a rapid recall feature to save time and enhance efficiency. Click here to see the best price. Rather noisy while charging despite 3 microcontrollers within the device to maintain the overall rate of efficiency in it. Therefore, after all these reviews, it is quite apparent that you have to consider a plethora of factors before zeroing on any of the Lipo chargers. Remember the best dual Lipo charger for you is the one that serves your purpose the best. This is why you must pay attention to the technical details of your device and then zero in on the most appropriate one for you. That will help you better match the features with your pre-decided budget that you may have set aside. 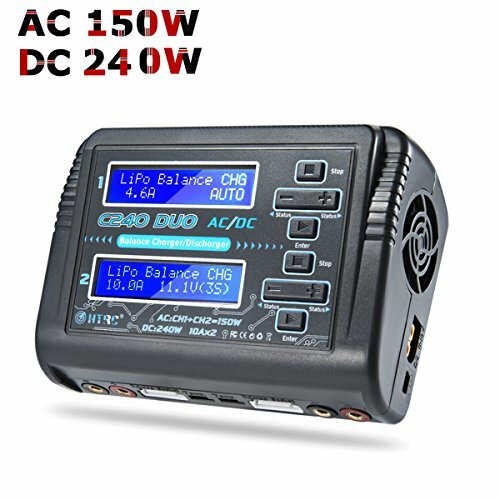 The dimension of the best dual lipo charger is crucial. Whether you are looking for something compact or ones that require adequate space may also decide the number of features you want to go with. Often paying attention to the dimension is all about knowing the device you are working with it exactly. That will no doubt give you a much better degree of understanding about how often you can use the product and for how long. The dimension also plays a key role in deciding the portability of the device. This is the next most important feature of a dual lipo charger. The total charging power and ability decide whether a particular piece is suitable for you. For example, if the total power of your charger is 240W, then that is its net power. This is irrespective of the charging points that it has. The final output will divide the net power with the number of ports that it has. So be very careful about assessing your exact power needs before deciding on the relevant option for you. That way you can match your requirements a lot more effectively. A USB port enhances the functionality of the dual lipo charger in many ways. It makes it a lot easy to install updates and connect the charger to any device at will. That essentially means you can carry this type of charger quite easily with you and connect it anywhere and anytime you wish to use it for an extended period. In other words, the USB port is one such feature that surely makes the charger a lot more versatile and an extremely practical option compared to many others that are available in the market. This is also a very crucial point. But it is a tricky matter too. This is a factor that depends on a lot of other elements too. The temperature, the power of the device and the number of batteries are just some of the factors that you must consider. The calculation is quite simple. You must go for options that help you get the job done rather fast and in an unequivocal manner. That is what will comprise of the most dependable options that you may eventually zero in for your batteries. This is that feature that seamlessly brings together convenience and speed. That apart, when you are looking for the best dual lipo charger, the term of warranty is also important. It is always advisable to choose options with the longest warranty period. Also, make careful consideration of the points that are covered under warranty. In short, you have to look for options that offer the best value for money deal and give you maximum advantage. That apart, you must also choose the features carefully to ensure that you are able to take advantage of every innovation that is introduced in the market to the maximum.